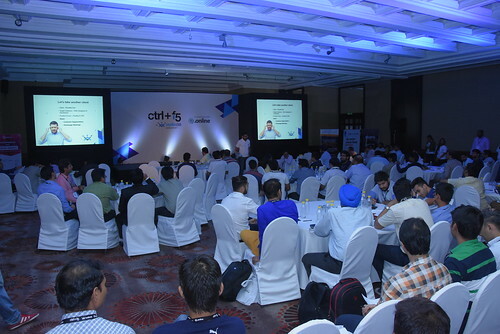 The Delhi edition of our flagship summit for Web Designers & Developers, Ctrl+F5 was every bit a great experience as the first one in Bangalore. The Delhi NCR belt boasted a stronger contingent of Web Professionals as the turnout tipped 120 well before the sessions kicked off, the enthusiasm of the audience was palpable! With our partners at Radix celebrating their 2nd anniversary of .ONLINE, .WEBSITE and .SPACE, the Ctrl+F5 Delhi was a fun, memorable & engaging day of great learning and opportunity. Our guests had a lot to share with us as well. For example, one big misconception among end customers is how the website denotes a starting point and not the primary objective of an online presence. Several of them fail to understand that the potential of online presence lies in the ease and accuracy of marketing it and not in merely possessing a website. Apart from acquiring talent, retaining talent is also quite a challenge. All the efforts and money invested in training the new candidate are wasted, the moment the candidate decides to make a switch for few extra bucks. The panelists took note of all these and addressed it during the course of their sessions, in addition to their primary agendas. “Persuasion starts with good design.” At around 11 AM, Felix kickstarted his session with a statement that most people who aren’t in the UI/UX space may find intriguing. He spoke about why design matters more than ever in today’s times and the reasons for why we need it. He professed that behavioural change is what we should be striving for through efficient design. The psychological impact of content and aesthetics are paramount in influencing a consumer’s buying decision and Felix delivered a very enlightening session to our guests that rammed this point home. Suveer’s session was more framework-based. He spoke about what the current state of digital marketing is in India and how one must go about it. He stated that we’ve got to start viewing ‘digital’ as an evolving ecosystem. Suveer spoke about the current trends & technologies, and how the traditional buying flow has slowly evolved to a more linear model with inputs from several sources and decisions being made at uniquely identifiable micro-moments. Suveer summed up his session saying that India is going to lead the growth in the Asian markets. He shared his experience over the years and urged business owners to understand their vantage point that they are in now and how to capitalize the same. Understanding the user and the context of his use is of prime importance. According to Shridhar, the context could be; why is he/she on a website? What is the type of device used? What are his/her needs?